Hot! Hot! Hot! Loved this one, and it succeeded in giving me butterflies in my stomach! Books that can do that are my favorite. This book was fast paced enough to not be boring, but reined in enough to allow us the opportunity to savor each romantic encounter, so that the developing relationship felt real. It started off in lust, escalating to a near uncontrollable passion and had the perfect amount of tension and resistance (and the hero resisted for good reason). Gabrielle Maxwell, a successful artist/photographer, was celebrating at a local Goth club with friends. She unwittingly sees a group of rogue vampires attacking a human in a back alley (rogues are vampires that kill indiscriminately). Capturing their image on a camera phone, she escapes to the nearest police station to report the murder. Laughed out of the station (the pictures don’t show much of anything, and really? Vampires? ), she is promised that an officer will check in on her later, to make sure she is ok.
As the evening progresses, she is visited by Lucan Thorne. Posing as an officer, but actually a vampire warrior, he witnessed her, “witnessing the Rogues” and is there to take her camera phone into “evidence”. Unable to deny their obvious attraction to one another, their encounters quickly heighten to passionate liaison. About to take her blood in a moment of ecstasy (not to worry – Lucan is not the “killing” kind of vampire – just a little nibble here and there 😉 ), he recognizes the “birthmark” hidden on her neck. And in an instant before his sharp teeth penetrated her fragile skin, his keen vision lit on a tiny birthmark just behind Gabrielle’s ear. He withdrew from the bed as though touched by fire, hissing a furious curse into the dark. Hunger for Gabrielle still pounded through him, even as he grappled with the ramifications of what he might have done to them both. Gabrielle Maxwell was a Breedmate, a human gifted with unique blood and DNA properties that complemented those of his kind. She and the few numbers like her were queens among other human females. To Lucan’s kind, a race comprised solely of males, this woman was a cherished goddess, giver of life, destined to bond in blood and bear the seed of a new vampire generation. And in a reckless lust to taste her, Lucan had nearly claimed her for his own. While she is unaware of the birthmark and it’s meaning, he realizes he just came close to bonding them as a pair. Circumstances quickly indicate that Gabrielle is in danger of the Rogues, including their leader (a powerful first generation, Vampire – hellbent on starting a vampire war). “And if the Rogues should realize she’s a Breedmate…” Dante added, his trailing comment drawing grim nods from the other warriors. “I know the protocol,” Lucan growled. He felt too much anger at the thought of Gabrielle in the hands of the Rogues, or those of another member of the Breed if he were to do the right thing and send her off to one of the nation’s Darkhaven sanctuaries. Neither option seemed acceptable to him at the moment, thanks to the streak of possessiveness that was burning his veins, unbidden and unwanted. Even though he craves Gabrielle, and can’t seem to stay away from her, his duty and only reason for living, is to lead and protect the Breed. Being the oldest and strongest in the lineage, he refuses to become encumbered and weakened with debilitating feelings of love and worry. This whole section is extremely exciting, as Gabrielle learns of Lucan’s true nature, and that of her own. Lucan eventually takes (forces?) her into his custody, bringing her to the warrior’s headquarters. As her feelings for Lucan deepen, and she bonds with the other Breedmate females in the establishment (wives of the other warriors), Lucan struggles with his own personal demons, and denies her the love she seeks from him. And therein lies the fun! While this is a typical theme in most of these romantic paranormals, the writing in this one made it so that I could actually feel their turmoil, and understand their sentiments. “You’re the only one,” he said thickly, giving her the honesty in return for the trust she had given him hours before. Gabrielle would be the last female he’d bring here too. He couldn’t imagine having anyone else in his bed, now. He would never permit anyone into his heart again. Because he had to face some hard facts, here – that’s what he’d done. For all his careful control and years of self-imposed solitude, he had let his emotional guard slip, Gabrielle had filled his void like no other ever could again. One minute he unleashes his passion for her, and the next he reels it all back in, reminding her that once she is out of danger, she will be moved into a vampire community where she can bond with an appropriate mate (since returning to her old life would be preposterous at this point). He opened the door, about to walk out. Ooooooohhhh that was COLD!! Tell me you’re not dying to read this and find out where it’s going after a line like that! Danger from enemies, from lovers…danger even abounds from those that you wouldn’t expect (a few interesting twists). While action and peril are the “gist” of the story, the burning passion between Gabrielle and Lucan, is the heart of it. You got me. I am going to add this to my 100+ list for 2010. Yep, I love both series. Ive read all of the Lara Adrian books that are out…I like Rio the most. Rio’s book is next for me! I just read this because your review made it sound so good. And you were right – I loved it. Thank you! Wow great review you got there. I’ve always heard about the books of Lara Adrian but always ignored it..
OMG, I am soo very into JR Ward’s BDB, and to find another series that is just as inviting oh yeah. I be loving this series and I have only just begun the series. Lucan is so male!! Love this series!!!!! Lucan is my favorite in the series!! Morning! Just a quickie note to THANK YOU for the BDB series recommendation, and to say it WAS as advertised — fabulous. Bought ’em all and plowed through them. YUMMY. Since you did so well with that set, thought I’d see what else you liked. Clearly we have similar taste. 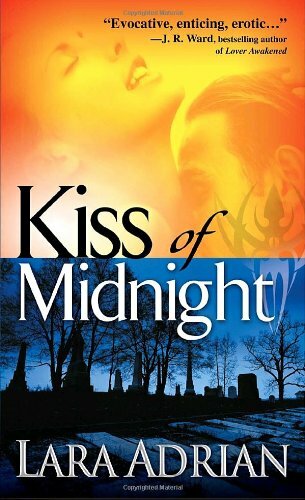 Kiss of Midnight is your first review I happened to click on, and we have a winner! Just bought it (Kindle) and can’t wait to get home tonight and dig in. I really like the way you back up your comments with excerpts from the book. Fully anticipate getting the entire series. PLEASE tell me the authors of recommended books/series appreciate you and the incredible job you do for them. Holy cow, they should be beating down your door bearing gifts and flowers! You are a marketer’s dream come true. Have a great day!